Perfect For Any Classroom Space, These Innovative, School Stack Chairs Are Built For Comfort And Durability. The 16" Seat Height Is Perfect For Children Ages 8 To 12 Years Old. Stack Chair Features A Molded Plastic Seat With Vented Back For Comfort, Reinforced Ribbing In Back And Under The Seat For Added Strength, Steel Powder-Coated Legs, And Steel Lower Back Support. Leg Color Matches Seat Color. Chair Legs Are Equipped With Composite Ball Glides Made For Durability And Protection On Carpeted Floors. Frame And Screws Do Not Penetrate Through The Seat Surface.. 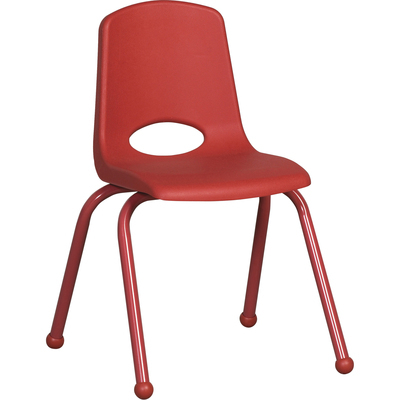 Perfect For Any Classroom Space, These Innovative, School Stack Chairs Are Built For Comfort And Durability. The 16" Seat Height Is Perfect For Children Ages 8 To 12 Years Old. Stack Chair Features A Molded Plastic Seat With Vented Back For Comfort, Reinforced Ribbing In Back And Under The Seat For Added Strength, Steel Powder-Coated Legs, And Steel Lower Back Support. Leg Color Matches Seat Color. Chair Legs Are Equipped With Composite Ball Glides Made For Durability And Protection On Carpeted Floors. Frame And Screws Do Not Penetrate Through The Seat Surface.